How many times you’ve got locked out of car, previously? Do you remember your feeling when it happened? Have you got frustrated? Car lockout incidents happens to thousands of people across the U.S. In fact, an average of 250,000 people lock themselves out of anything in one year period. However, it can happen to you, too, not once. A split of second is enough to get locked out of car. This is one of many reason why we provide emergency locksmith services in Bethlehem PA, as well as 24 hour, round the clock locksmith services. Another thing to consider, not only you can lock yourself out of your car early morning, but also late at night. We can unlock the door of your car in no time. With this intention, we offer 15-20 minutes arriving time since your initial call. The average time to unlock any car is 2-5 minutes. With this in mind, you can get back on the road with 20 minutes, at the latest. This is a common problem to many people. The most dangerous time to lock your keys in the trunk is after shopping. Imagine the moment when you get out of a shopping mall. Your hands full of bags, and you hold the keys between your fingers. Soon after opening the trunk, you leave the bags inside, dropping your keys without paying attention. You close the trunk, looking for the keys, only to realize you left them inside the trunk. To open a trunk, can be a time consume. Yet, there is no reason to get panic. There are several methods to unlock a trunk without a key, but it’s equally important to mention that if there is no way to unlock your trunk, we can make a valet key to open the doors and the trunk. 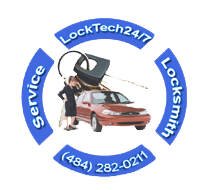 We are emergency automotive locksmiths in Bethlehem PA, working for you 24 hour a day, 7 days a week. In addition to Bethlehem, we also serve Allentown, Easton, and the entire Lehigh Valley, Pennsylvania. Our locksmiths can help you with more automotive locksmith services, such as; car keys made on site, and car keys program, as well as ignition lock repair or replace. When you need an emergency locksmith in general, and to unlock your car in particular, we are here to help.